German carmaker BMW will buy cobalt, a key component for electric vehicle (EV) batteries, directly from mines in Australia and Morocco to ensure they are not produced by child labour, an executive said on Tuesday..
Andreas Wendt, BMW board member responsible for procurement, told a briefing in Paris that the new supply of cobalt would be used in the carmaker's next generation of EVs in 2020.
for what its worth, First Cobalt Corp. - ASX: FCC; TSX-V: FCC; OTCQX: FTSSF - has successfully produced a battery grade cobalt sulfate using the First Cobalt Refinery flowsheet. This .... brings the Company closer to recommissioning the only permitted primary cobalt refinery in North America; discussions currently underway with automotive companies, cobalt miners and capital providers [to] now move to a more advanced stage. Cobalt prices were surging so much last year that thieves were carrying out elaborate heists at warehouses in Europe’s busiest port. Now, prices are in free fall and mining companies are taking the financial hit. The story of what happened is the classic boom-bust in commodities. In the case of cobalt, it was Elon Musk’s vision of electric cars gaining mass appeal and an ensuing rush of money to bet that the world will need a lot more cobalt, a critical component of lithium-ion batteries. Adding to the allure was a widely-held view that cobalt supply is constrained. Geologically speaking, the metal isn’t rare, but almost exclusively produced as a byproduct of copper and nickel mining. The idea that more cobalt supply depended on higher prices for those metals turned out to be a myth. Instead, the surge in cobalt prices triggered a boom in supply from the Democratic Republic of Congo. Prices have plunged more than 60 percent from a peak in April 2018, to $15.88 a pound, according to Fastmarkets MB. The company plans to dismiss 2,700 workers and the conditions of their departure are being negotiated, according to the person familiar with the matter. Boss is a joint venture between ERG, which owns 51 percent of the Lubumbashi-based company, and state-owned Gecamines. Albert Yuma, the president of Gecamines, didn’t answer calls and emails seeking comment. Mines Minister Martin Kabwelulu said in an email he didn’t have any official information about Boss’s closing. Yuma has repeatedly criticized Gecamines’ existing partnerships as too generous to international mining companies, yielding minimal benefits to the government and state miner in the form of profit taxes and dividends. Glencore Plc is planning to cut production at one of its largest copper and cobalt mining operations in the Democratic Republic of Congo, the Wall Street Journal reported citing sources on Tuesday. The company also plans to lay off about 2,000 employees, mostly contractors, at the Mutanda mine in the Katanga province, the report said, citing people familiar with the matter. Five mining executives contacted by Reuters said they were not yet operating on the assumption that Tshisekediâ€™s win would be validated by the Kabila-appointed Constitutional Court and expected the outgoing president to fight to keep his stranglehold on the sector. None wanted to speak on the record. In a surprise twist, Democratic Republic of Congo opposition leader Felix Tshisekedi was declared the winner of last monthÃ¢â‚¬â„¢s presidential election, although his victory is being marred by claims by a rival that the poll was rigged. The African country is the worldÃ¢â‚¬â„¢s main supplier of battery ingredient cobalt and a key source of minerals from copper to tantalum. That means miners, analysts and users of the metals Ã¢â‚¬â€ which range from carmakers to mobile-phone companies Ã¢â‚¬â€ will be keeping a close watch on what happens next. The primary cobalt-producing jurisdiction on the planet underwent a seismic shift over the weekend as voters decided on who would replace President Joseph Kabila, who is stepping down after 17 years in power. The Democratic Republic of Congo (DRC) underwent a chaotic (and delayed) election on Sunday (December 30), where three candidates put their hands up to lead the country, which has been at the center of mining news throughout 2018 as major global miners grappled with a new mining code that targeted highly lucrative metals. The outcome of the election Ã¢â‚¬â€ fought between Kabila-backed former interior minister Emmanuel Ramazani Shadary, businessman Martin Fayulu and Felix Tshisekedi, leader of the largest opposition party in the National Assembly Ã¢â‚¬â€ will not be known until later this week, though both the Shadary and Fayulu camps are claiming victory. The world is watching: the UN released a statement in the lead up to the vote, saying it Ã¢â‚¬Å“took noteÃ¢â‚¬Â of delays in the democratic process. Results are expected from the national electoral commission, CENI, this week, though as mentioned the Fayulu camp is claiming he has won the election, while the Shadary camp has said Ã¢â‚¬Å“victory is certainÃ¢â‚¬Â for the anointed successor to the Kabila regime. 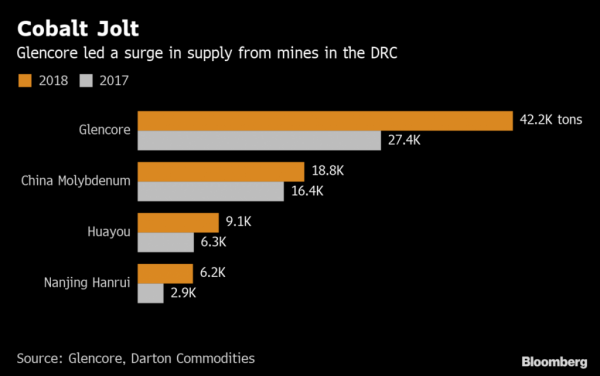 The DRC is the worldÃ¢â‚¬â„¢s primary source of cobalt, accounting for 58 percent of global production at 64,000 tonnes per year. Prices for cobalt fell through 2018 thanks to a volatile commodities market, and in 2017 the Kabila government revealed plans to claw back more royalties from the lucrative metal Ã¢â‚¬â€ which along with copper it classes as Ã¢â‚¬Å“strategic.Ã¢â‚¬Â It was hit with an additional 10-percent tax, prompting fierce backlash from miners operating in the country. The alliance of major miners pushing back against the code included Glencore (LSE:GLEN), Ivanhoe Mines (TSX:IVN) and Randgold (which merged with Barrick Gold (TSX:ABX,NYSE:ABX) earlier this year). But it was all for naught as Kinshasa stonewalled negotiations. Kabila has been in power since 2001, when his father Laurent Kabila was assassinated by one of his bodyguards. Joseph Kabila was meant to stand down two years ago after he was barred from running for a third term by the constitution. The elder Kabila himself came to power in 1997 following the First Congo War, when he led rebel forces to overthrow the previous dictatorship. The election cycle this year was punctuated with troubling reports of meddling and unrest, questions over electronic voting, an incident that saw 7,000 voting machines burned and constant warnings of terrorist threats. The fate of a crucial agreement between cobalt hopeful Australian Mines and major South Ã‚Â­Korean chemicals company SK Innovation remains up in the air after a key deadline came and went. SK had until December 31 to exercise an option that would have given it a 19.9 per cent stake in Australian Mines for just over $80 million. But the option has been well out of the money in recent months, leading to questions over whether the Korean giant will exercise the option or try to negotiate a new agreement. The option had a strike price of 12c per share, well above the 3.8c per share at which Australian Mines closed on New YearÃ¢â‚¬â„¢s Eve. The $80m option was part of a crucial offtake agreement signed between the two groups last February. December 31 also marked the date by which Australian Mines was supposed to have obtained funding for the development and construction of its Sconi cobalt project in Queensland. That deadline was one of three material conditions precedent to the offtake agreement. The agreement did provide for the financing condition to be extended under mutual agreement between the two companies, although there has been no announcement of any such extension to date. Australian Mines managing director Benjamin Bell did not return calls yesterday. The company was among the best-performed companies on the Australian Stock Exchange in 2017 as it capitalised on the growing investor excitement about the potential impact of electric vehicles on cobalt demand. But the past year has represented a major reality check for the cobalt sector, and shares in Australian Mines have been hammered in recent months amid a broader selldown throughout the cobalt space. The price of cobalt has more than halved since March amid a surplus of cobalt in China, which is the worldÃ¢â‚¬â„¢s biggest manufacturer of cobalt chemicals and electric vehicle batteries. Both Australian Mines and its bigger Australian rival, the Robert Friedland-backed Clean TeQ Holdings, have also released bankable feasibility studies into their respective projects that underwhelmed the market. Australian MinesÃ¢â‚¬â„¢ study found Sconi would cost $US974 million ($1.38 billion) to build and would generate a post-tax internal rate of return of 15 per cent. However, the study was based around cobalt and nickel prices above current spot prices. Clean TeQ was hit particularly hard after it found its Sunrise cobalt-nickel project would cost $US1.4bn to build and featured an internal rate of return of 19.1 per cent, although investors questioned the studyÃ¢â‚¬â„¢s price and taxation assumptions. "Gertler has used his close friendship with DRC President Joseph Kabila to act as a middleman for mining asset sales in the DRC, requiring some multinational companies to go through Gertler to do business with the Congolese state. "As a result, between 2010 and 2012 alone, the DRC reportedly lost over $1.36 billion in revenues from the underpricing of mining assets that were sold to offshore companies linked to Gertler. "The failure of the DRC to publish the full details of one of the sales prompted the International Monetary Fund to halt loans to the DRC totaling $225 million. "In 2013, Gertler sold to the DRC government for $150 million the rights to an oil block that Gertler purchased from the government for just $500,000, a loss of $149.5 million in potential revenue. Gertler has acted for or on behalf of Kabila, helping Kabila organise offshore leasing companies."